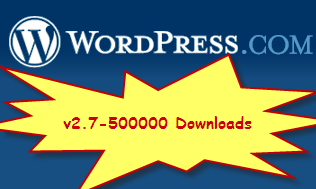 500000 Downloads Of WordPress 2.7 In 9 Days!! WordPress download counter shows that 5,00,000 copies of WordPress 2.7 package are downloaded in 9 days time. Wow!! That shows the popularity of the new features packed in the version 2.7 of WordPress. On December 11, 2008 WordPress 2.7 was released to public and by December 19, 2008, 5,00,000 downloaded were recorded. It means approximately a copy of WordPress was downloaded for every 2 seconds. WordPress Download counter tracks the number of downloads of every release and it is reset just after the release of every new version. 4 Comments on 500000 Downloads Of WordPress 2.7 In 9 Days!! Is there any hack for migrating from Blogger to WordPress? 1Pingbacks & Trackbacks on 500000 Downloads Of WordPress 2.7 In 9 Days! !